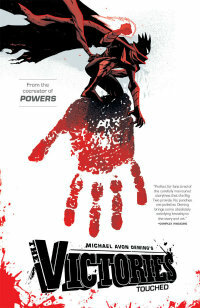 Writer/artist Mike Avon Oeming’s 5 issue mini-series, The Victories is now available as a Trade Paperback from Dark Horse. I review the collection of the mature superhero tale here at Broken Frontier. Powers is the long running series that helped to make writer Brian Michael Bendis and artist Mike Oeming launch successful careers. Now, Marvel are relaunching the series, with a new #1 issue, which hits on November 25. Before that, if you want to catch up on all that’s been going on in the Powers universe in the previous series, you can grab the Powers Encyclopedia Vol. 1 on November 4. Below are a few text-free pages from #1, the covers of #2, #3 and the Encyclopedia, and the official skinny on the series. Bendis & Oeming’s Award-Winning POWERS Returns With All New Series! The most popular super hero crime comic of the decade returns in November with Powers #1, from the award-winning team of Brian Michael Bendis & Michael Oeming! Lauded by fans and critics alike, Powers has emerged as one of the most successful creator owned comics of our time and begins an all-new chapter perfect for readers new and old. Homicide detectives Christian Walker and Enki Sunrise investigate murders specific to super hero cases. Shipping monthly—yeah, you heard us—Powers returns not only with your favorite detectives, but also with the letter column you have to read to believe! While developing and producing the live action Powers TV show for FX, Brian Bendis and Powers will appear on Howard Stern’s Geek Time, Saturday October 17th. This follows the selection of Powers: Who Killed Retro Girl? as the first pick of the month on Geek Time. Plus, don’t miss Bendis on G4’s Fresh Ink, Attack of The Show and more major media outlets, spreading the word about Powers! If you haven’t read Bendis & Oeming’s Powers before, then we’ve got the antidote for your blues—pick up Powers #1 in November and find out what you’ve been missing! Plus, don’t miss Brian Bendis on Howard 101 this Saturday, October 17th, as the special guest on Geek Time from 2:00-4:00pm ET! This is a series definitely worth following. Mixing elements of The Lord of the Rings, Star Wars and epic battles involving talking mice in medieval garb. Don’t let that last part fool you though – if Walt Disney and Tolkien had a love child…actually, no, forget that. Ewww. 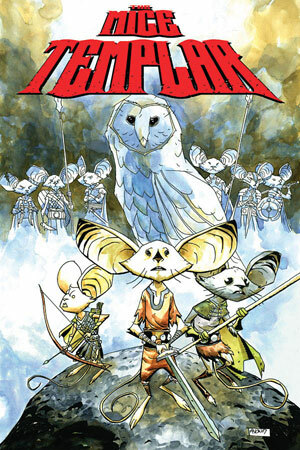 Mice Templar is a thoroughly entertaining read. The second volume, entitled Destiny has just begun and the third ish hits on September 2 – all for only $2.99, despite what the cover says. That’s good value for a 32 page comic. There’s a recap in each issue in case you’ve missed one, and it’s obvious that writer Bryan J.L. Glass has thought about the lore here. There’s a rich tapestry unfurling involving visions, prophecies, all manner of vicious creatures and a young mouse called Karic. With lines like, “Long ago, beneath the great dimmed eye of Wotan,” and “what glorious, self-righteous wretches we were,” Glass shows his skill at the craft of building an invigorating fantasy. 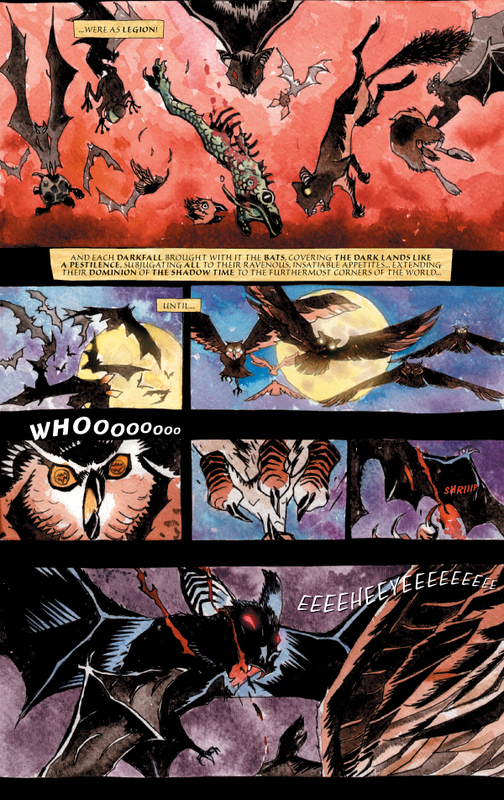 It’s all very bloody, and Oeming’s work is nothing short of remarkable. This, and Rapture, his current Dark Horse series with his wife displays his diversity extremely well. His battle scenes jut out from the page and make you feel like you’re in the thick of the action, with limbs flying, and claws slashing, and his watercolour pieces are just as superb. 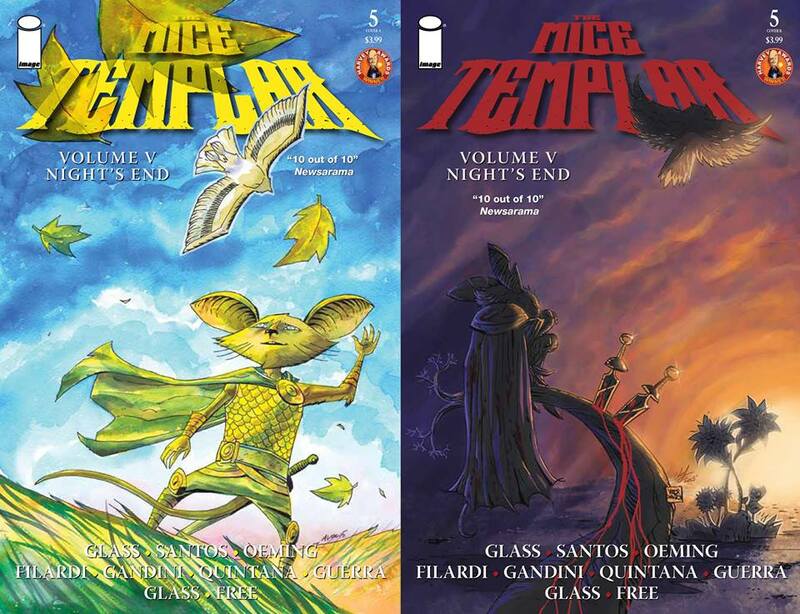 Mice Templar is a series that demands commitment and is better enjoyed as a TPB. The first series is available as such now, or you can check out 100 (!) gorgeous pages from it at the MT site. In my handful of new comics this week, these two stood out from the pack. They remind me precisely why comics can do only what comics can do – big ideas, with bigger execution. Dark Horse’s Rapture #1 tells the story of two lovers going through a time out in the middle of an ongoing superhero/villain war. This war has devastated America and the government has had enough. In this set up issue (with 5 more to come) the superpowered individuals are mere background characters. Their effect on the world at large is the pivot point. There’s no specific event alluded to that tipped the scales and made the costumed adventurers flee the planet, but it seems like one of those huge summer x-overs that Marvel and DC give us every year. We’ll probably never know anymore of the heroes than that in this series, but the lovers, namely Evelyn and forlorn muso Gil steal the show. The absence of spandex will not be missed as the shambles of a world that humanity now resides in is intriguing enough, with cannibalistic mobs and Spectre-like hero The Word’s mission to the weary Evelyn. Created by Mike Avon Oeming and his wife Taki Soma the fluidity of the script and visuals is daring. With newspaper clippings and handwritten notes between the separated lovers, it’s slightly different from Oeming’s usual work, but it works splendidly. It’s like Kingdom Come with hints of Civil War, in its use of themes if not superheroes, and the human element behind the superhuman reality makes for an intriguing tale. On the Rapture MySpace page you can see some pretty art and enter a competition for your own sad love tales. Image’s Chew is likewise a nifty concept. Created by John Layman and Rob Guillory it takes a few pages to realise why this cop tale is off-centre, and it’s this; due to bird flu chicken has been outlawed. Tony Chu is a cop who is also cibopathic. That means he gets impressions off everything he eats. One bite of an apple and he can tell where it was harvested and what pesticides were used on it, etc. He also is able to take that skill and apply it to human flesh. He uses this when he hunts down a serial killer at a “chicken speakeasy” and is rewarded with a job at the now powerful FDA (Food and Drug Administration). This 5 part series is off to a good start with it’s combination of whacky premise, great humour and violence. Layman and Guillory mention in the afterword how they were inspired by The Walking Dead’s Robert Kirkman’s video manifesto last year that urged artists and writers to risk producing more of their own creator owned ideas. Its good to see Kirkman’s sincere plea bearing such good fruit. Dare I say that Chew is a tasty morsel? Yes, indeed. That’s exactly what it is. I’ve been following this series since it began. It doesn’t have the traits of my usual picks, ie, no spandex, or space ships, or surprising resurrections. It doesn’t even have any secret identities! But what Mice Templar does offer is great story telling, and that’s enough to make it stand out from the superheroes crowding the racks. Writer Bryan J.L Glass (Magician: Apprentice) and artist Mike Avon Oeming (Powers) are crafting this series in to the next great epic in sequential art. I’d compare it to Lord of the Rings since it deals with a dirty fantasy world rich in textured history, but it can also win favour with the Narnia crowd in the way it wraps deceptively cute anthropomorphic adventures in a cloak of adult themes. It would undoubtedly be a more engrossing experience reading the complete series, once finished, in collected form, but thankfully each issue has a handy reminder of what’s come before to refresh the memory. Since this is a bi-monthly series, this addition is particularly welcome and the casual reader should find enough with any issue to be hooked immediately, and the handy MT web-site will also fill you in on all you need to know. The story told thus far concerns Karic, a young mouse who is rising up to become the next Templar, a long lost group of holy warriors who destroyed themselves long ago. After Karic’s village was raided and his family lost, he managed to rescue and befriend that old fantasy favourite-the mentor, and his rise to glory and greatness continues unabated. Actually, that’s not entirely true, which is what makes this series so exciting. There is always a sense of dread when reading Mice Templar, as betrayals and deaths and bloody battles drag the story to it’s unknown conclusion. Rats and owls and bats all seem horrendously fierce in a world where your best weapon is a lack of trust and a quick pair of legs. Karic’s earnest desire to fulfill the Fish Gods prophecy for him leads him to meet other Templars, such as Pilot (whom he rescues) and the bitter Cassius. 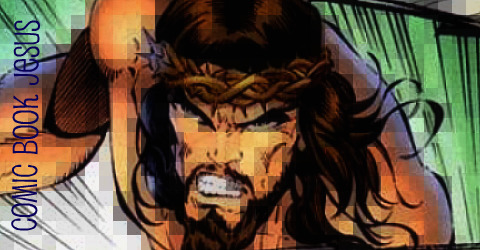 Each issue ends on a cliff hanger as every rousing tale should and this one is no different, in which Karic must question his motivations thus far. Is his hope and admiration for the Templars a deserved one, or is he just way too naive and in over his head? With rats tormenting Karic’s captive family, together with danger and disappointment wherever he turns it appears Karic has a hard road ahead, but it’s certainly a joy to watch him walk it. Like the young legend-in-training, we too never know what’s around the corner. It’s also a joy to look at, as these preview pages attest. 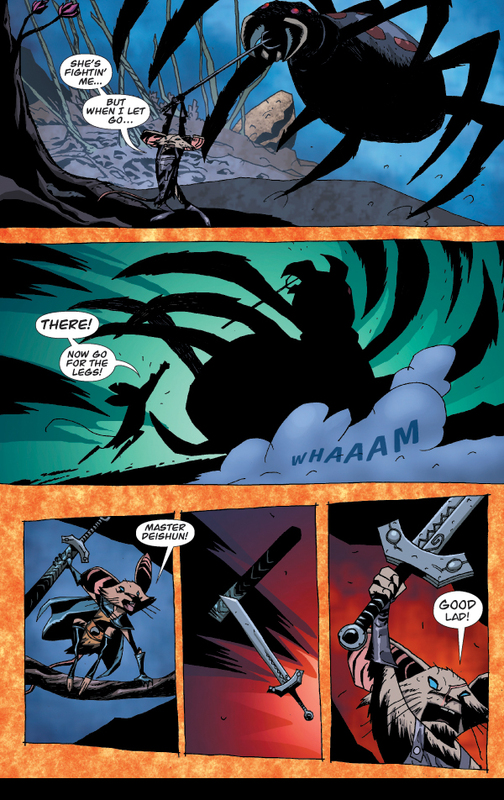 Oeming’s artwork never fails to delight and here resembles Mike (Hellboy) Mignola in his use of hard edges and prominent use of shadows, but with a more versatile approach to bold layouts. His eye for page design is frequently inventive and matches the varying pace of the story’s rhythm. Wil Quintana’s colours can not be ignored either. From sunlight pouring in to caves, to moonlit battles and cities illuminated by torches, it’s a luscious book to behold. Thanks to these two artists every page looks vibrantly different and demands more than just a cursory look. Really, this is what good, or rather, great comics are all about – engrossing characters risking it all who take readers with them on a dangerous journey. I’m not exactly sure where the road will end, but, like driving in the dark with a mumbling hitchhiker, it’s scary and uncertain but definitely entertaining.